A new tool provides a measurable baseline for cities to understand how they are meeting goals for sustainable and inclusive growth. Cities are shaping the future of our planet. They are where people confront environmental problems and tackle the challenges of sustainable development. On the United Nations’ 2030 Agenda for Sustainable Development (a shared global roadmap for ending poverty, protecting the planet and fostering equitable economic growth), Goal 11 is to make “cities and human settlements inclusive, safe, resilient and sustainable”. But what does an inclusive city look like? How can we measure whether urban areas are managed sustainably? And how can we ensure climate action addresses the needs of urban residents, leaving no one behind? Despite the high-stakes nature of this goal, data that tracks cities’ progress towards it is scarce. Our first-of-its-kind research tool, the Urban Environment and Social Inclusion Index (UESI), aims to fill this data gap. It leverages high-resolution, large-scale and census data on a neighbourhood scale to reveal how more than 30 cities perform at the intersection of environmental and social equity. This unprecedented level of detail reveals how residents living in the same city often experience urban environments in vastly different ways, helping decision-makers target future policy interventions better. In the image below, for instance, the Los Angeles neighbourhood with the highest average income level experiences the least intense urban heat island effect. Lower-income neighbourhoods, in contrast, experience higher levels of urban heat, which can create additional expenses, barriers to productivity and public health risks for already vulnerable populations. 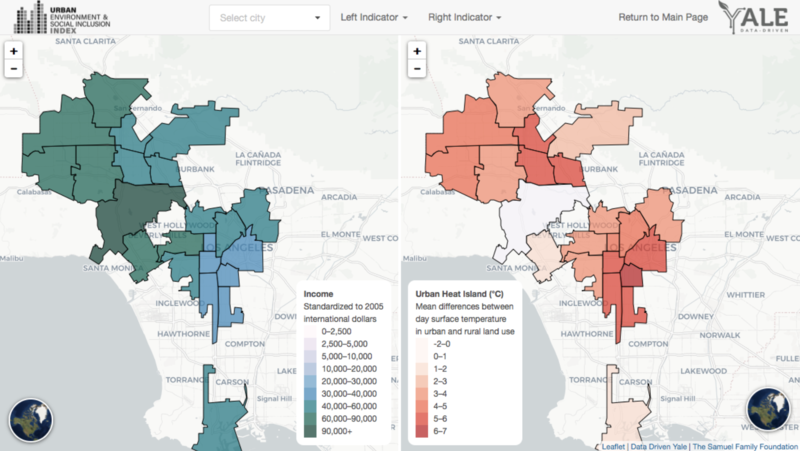 Screenshot of the Urban Environment and Social Inclusion Index portal, comparing neighbourhood levels of urban heat island effect and average income in Los Angeles. In cities across the world, the index finds that poorer neighbourhoods take on a disproportionate share of environmental burdens. Even cities with strong overall environmental performance often share benefits (such as public transit and green space) and burdens (such as air pollution and urban heat) unequally. The graphic below summarizes cities’ results along these two dimensions of environmental performance and social inclusion. 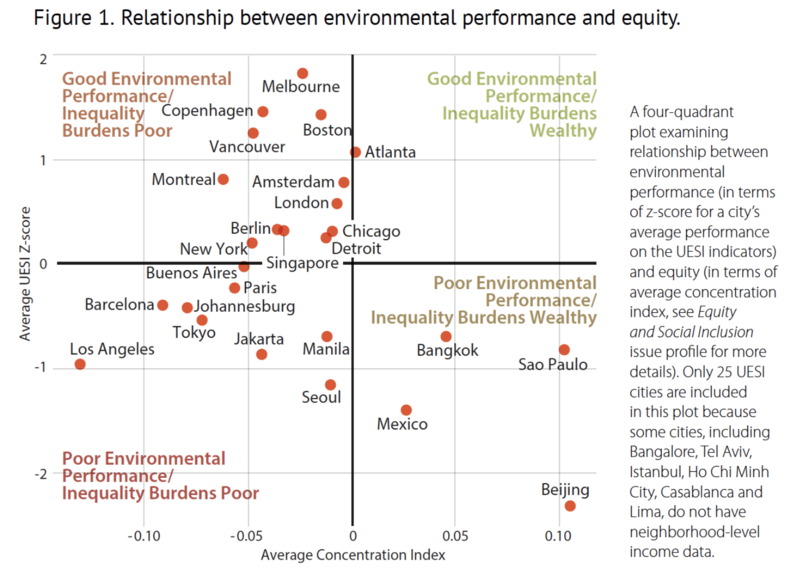 It shows that most cities fall on the left-hand side of the plot, indicating that good and bad environmental performers alike are disproportionately burdening poorer populations with environmental challenges. Source: Hsu, A., et al. (2018). 2018 Urban Environment and Social Inclusion Index. New Haven, CT: Yale University. Inequality, in other words, remains a challenge for a wide range of cities. Even strong environmental performers, such as Melbourne, Vancouver, Copenhagen and Boston, need to incorporate equity into environmental interventions. In cities such as Mexico City and São Paulo, high-income residents’ decision to cluster in downtown locations, near urban amenities, may expose them to especially high levels of air pollution and urban heat. It is important to note however, that in many of the cities in the lower-right-hand quadrant, where high-income neighbourhoods face a disproportionate share of poor environmental performance, lower-income neighbourhoods still face significant environmental hazards. In Beijing, for instance, access to air pollution remains relatively equal across different income levels, but still poses dramatic risks to all residents, and particularly to low-income residents who may have less resources to combat it. While environmental performance varies within and across cities, some key trends stand out. A staggering 96% of residents living within UESI cities breathe air that exceeds the World Health Organization’s guidelines for safe exposure to fine particulate pollution (PM2.5), one of the most dangerous urban threats to human health. This finding echoes other recent research tracking extraordinarily high levels of global exposure to air pollution. Across the more than 30 cities that the UESI considers, only Amsterdam, Atlanta, Barcelona, Boston, Copenhagen, Melbourne, Montreal, New York, Tel Aviv and Vancouver have neighbourhoods with PM2.5 levels below this threshold. Source: Hsu, A., et al. (2018). 2018 Urban Environment and Social Inclusion Index. New Haven, CT: Yale University. Adapted from the 2018 State of Global Air Report. Cities are also struggling on climate change, a particularly relevant concern given that negotiators are meeting in December in Poland to hammer out the details of how to implement the Paris Climate Accord. A warming planet is contributing to water stress that already affects more than a third of the UESI cities. Cities have lost tree cover equivalent to the entire area of Barcelona over the last 15 years. Unsurprisingly, neighbourhoods with the greatest losses in tree cover are those that have experienced increases in urban heat island intensity. Although most cities have created policies to address their own mitigation, adaptation and monitoring efforts, a few cities, including Tel Aviv, New Delhi, Casablanca and Bangalore, lack urban-scale climate plans altogether. Through a new level of transparency and detail, the UESI provides a measurable baseline for cities to understand how they are meeting - and not meeting - goals for sustainable and inclusive growth. This tool also empowers urban residents to understand the impact of environmental burdens on their neighborhoods and defend their rights regarding sustainable well-being. While there are certainly gaps that remain, including the lack of waste management and recycling data, we hope this tool will expand to include more cities and data, taking advantage of advances in information and technology innovation that make it possible to shed new light on persistent problems.